The majority of Americans engage in aggressive driving, according to a recent survey conducted by the AAA Foundation for Traffic Safety. The survey found that as much as 80 percent of drivers in America have engaged in some kind of aggressive driving behavior within the last year. This type of behavior is dangerous, and has made it more difficult for good, non-aggressive drivers to stay safe behind the wheel. The survey identified speeding, honking, and yelling at other drivers as common aggressive driver behaviors, but more alarming behavior like purposely tailgating, ramming another vehicle, and getting out of the car to confront another driver were also found to occur. Drivers have noticed an uptick in actions like these, and a separate survey conducted by AAA found that two out of three drivers believe aggressive driving is a bigger problem today than it was three years ago. It may come as no surprise then that the National Highway Traffic Safety Administration announced this month that an estimated 35,200 people were killed on the road in 2015, up 7.7 percent from 32,675 in 2014. In light of this information, here are five tips for good, non-aggressive drivers looking to stay safe around aggressive drivers on the road. You won’t be able to prevent another driver from driving aggressively, but you can ensure that you don’t add to the problem. If you are calm behind the wheel, it will be easier to stay that way when you do encounter an aggressive driver. One way to stay calm on the road is to give yourself some extra time to reach your destination, and reduce the need to speed, according to AAA. The extra time will alleviate the stress that can occur in the car when you think you will be late to where you are going. Listening to calm and soothing music can also help to create a stress-free environment. It is easy to spot aggressive drivers on the road when they are speeding, tailgating, and aggressively switching lanes. If you notice an aggressive driver it is best to steer clear of them, and keep your distance. This will prevent you from getting in their way, and avoid any possible confrontation you may get in with them. It will also keep give you time to react or stay out of harm’s way entirely if their dangerous driving causes an accident. One way that aggressive driving commonly manifests itself is through tailgating. This could occur for a number of reasons, but is most likely the result of a person driving too slowly. If this happens to you, the best thing to do is clear a lane so the aggressive driver can pass, according to the Federal Highway Administration. Slowing down or speeding up could further prevent them from passing you and may only serve to aggravate them more. Putting on your blinker to indicate that you will move out of their way as soon as it is safe is your best option when dealing with aggressive, tailgating drivers. Be sure to keep an eye on your rearview mirror so you are aware if an aggressive driver is tailgating you. If you were driving a little slowly in the passing lane or accidentally cut someone off, they may yell at you or offer an obscene gesture in return. It is important to remember that it takes both drivers engaging with each other to create a confrontation, so if you don’t engage, it is likely they will eventually move on. Although it is tempting to return their abuses, it is recommended to refrain from even making eye contact with them, according to AAA. 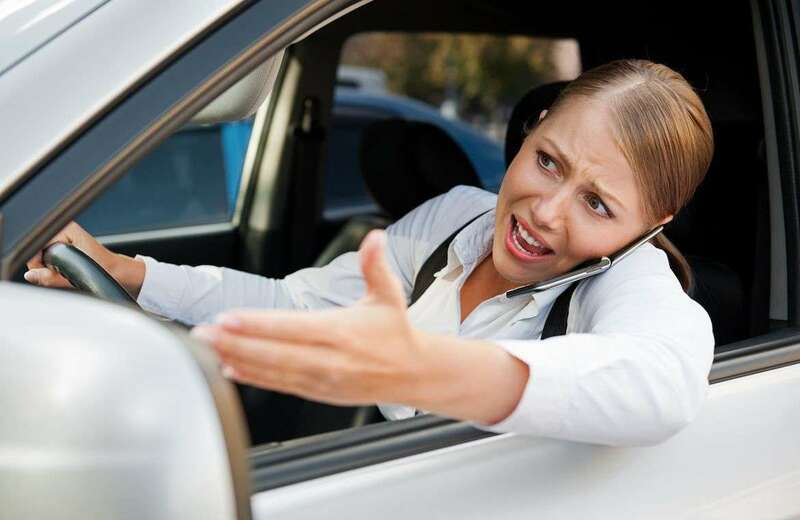 This may prevent you from even seeing what kind of gesture they make, but more importantly, you can avoid creating a situation that is perceived as a challenge to their supremacy, which may further escalate the other motorist’s aggressive behavior. In this scenario, don’t pull over to the side of the road, because the aggressive driver may take this as an invitation for confrontation. Instead, continue driving to a public place and make the call from there. If you feel particularly in danger, make the call from your car, assuming your state does not have laws that prohibits drivers from using cell phones. Ultimately, even if you are a good, non-aggressive driver who obeys the rules of the road, you will still have to share it with people who hold up Mad Max as the ideal driver. The most important thing you can do is set a good example for others by not engaging in risky behavior that causes car accidents, and hope that your driving etiquette rubs off on those drivers who are more aggressive.